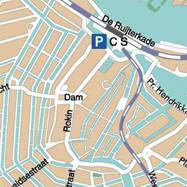 Where to park your car in the center of Amsterdam? The best way to visit Amsterdam is by train, especially if you need to be in the center. Parking is expensive and it is difficult to find a parking spot. You can use free parking spot outside the center and use the public transport to continue. There are also some cheap Park+Ride parking located at the A10 ring. What is the chance of getting a parking spot in a garage? 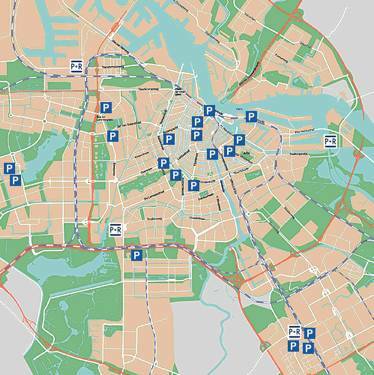 In Amsterdam dynamic signs give information about the available space in the ten car parks in and around Amsterdam center. You can also check availability on the internet. Are you come of plan to Amsterdam? Here you can see where the P+R parking areas are located. Richting S 100, afslag centrum, volg P borden. A day ticket is valid 9 a.m.-7 p.m. in the entire city, but not in the evening. It costs € 26,40. To park in the evening you should buy a night ticket, valid 7 p.m.-midnight; its price varies depend on the part of town - € 4,40up to € 17,60. Day and night ticket costs depending on the area of town up to € 39,60. A week ticket for the entire city costs € 158,40. Since of April the first 2002 the parking license for disabled and the free day card are no longer valid. But when you possess an European disabled cardpark card, you can park for free in whole Amsterdam. Occupants and companies situated in Amsterdam can qualify for a park license. The conditions for obtaining the license may differ per quarters. The car is for most of people an indispensable pleasure. Bezoekjes to family, the messages, holiday, to the work. without car we are nowhere. Because a car is nevertheless frequently duration and stands still, for many people it has been shared autogebruik an extraordinarily malignant solution. rates: hourly rate € 3.40/€ 4,- depending on hours of the day, daily max. € 36,-.
capacity: 600; open: Monday - Thursday, Sunday 7.00 a.m. - 1.00 a.m. Friday – Saturday 7.00 a.m. - 2.30 a.m.; rates: hourly rate € 3,40; max. € 27,50.
rates: hourly € 3,40 , daily rate with 10% discount. rates: € 3,40 per hour, daily rate € 47,50.
open: 7.00 a.m. - 1.00 a.m.
Never leave anyting of value in your car! Not even in a closed car park! The Hotel Terminus is spread over several buildings dating from the 18th century and is located within 500 metres of many of Amsterdam's historic sights. The Hotel Neutraal is a low budget/back-packers hotel in the center of Amsterdam, only a minute's walk from the central railway station. The Hotel Manofa is a four-floor hotel centrally located in the heart of Amsterdam on Damrak, Amsterdam's main street, just 60 metres from the flower market and the red light district. The Hotel Damrak set along Amsterdam's lively Damrak, only 300 meters from the city's Central Station.